The following blog post was written by Martina Koegeler-Abdi. She received the 2015 Evelyn Abdalah Menconi Travel Grant to visit the Arab American National Museum and conduct research. Koegeler-Abdi describes her experience in this post. Learn more about the 2016 grant and how to apply. The Arab American National Museum and its incredible staff have been very supportive during my archival research and throughout my dissertation project on Arab American women’s self-representation. I came across the unpublished memoir “Arabian Antipodes” by Rosemary Hakim in their catalogue during my initial research in 2014 and Kirsten Terry-Murphy was kind enough to scan and send a copy of the memoir to my location at the University of Copenhagen. In the meantime, the AANM Collections Online site offers more and more electronic sources from their archives, but I want to emphasize here how rich and manifold the physical holdings of the library are. I am very grateful for the generous support of Evelyn Abdalah Menconi Travel Grant, which enabled me to visit the Arab American National Museum for 10 days in August 2015 and this stay has proved invaluable for my dissertation research. During my stay I was able to gather much more contextual material around Rosemary Hakim and the Miss Lebanon America beauty pageant. This research will be the basis for 2 dissertation chapters and an article manuscript, which is currently under final revisions for the Journal of Transnational American Studies. Further, access to the Evelyn Shakir and Michael W. Suleiman collections was absolutely key to shaping the foundation of my dissertation: Shakir offers a meticulously transcribed wealth of oral histories from Arab American women throughout the 20th century and her collection also contains club minutes, correspondence and invitations to events by the Syrian Ladies Aid Club in Boston. The Suleiman collection is incredibly rich, and among other documents on Arab American research it also stores historical sources ranging from the early Arab American press all the way up to contemporary Arab American activist organizations. 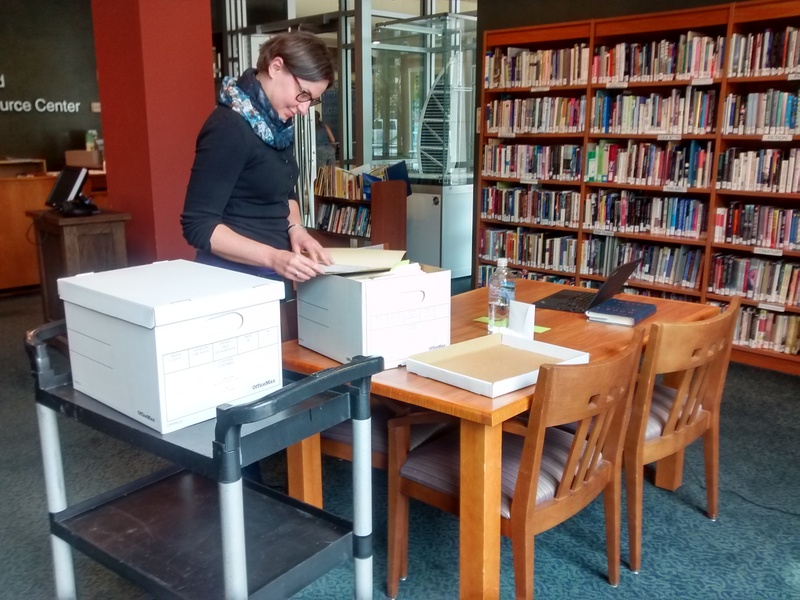 The physical access to the archives has made a tremendous difference to my research and I also want to thank again Kirsten Terry-Murphy, Matthew Stiffler and all the staff for their support, advice and the kind welcoming atmosphere. This entry was posted in Uncategorized and tagged Collections, Travel Grant. Bookmark the permalink.